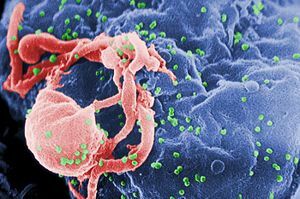 Scanning electron micrograph of HIV-1 budding from cultured lymphocyte (white blood cell). Multiple round bumps on cell surface represent sites of assembly and budding of virions. A disease is an illness, sickness, or abnormal condition of an organism that impairs bodily functions and is often characterized by typical symptoms (problems) and signs (physical findings). Diseases or unhealthy states can be caused by infection, diet or other conditions of life, or may be inherited. Epidemiology is the branch of medical science which investigates and describes the causes and spread of disease and develops the means for prevention or control. Epidemiologists may study many different illnesses, often focusing on major infectious diseases such as influenza or chickenpox. Epidemiologists can be separated into two groups—research and clinical. Chronic (long-term) diseases—such as heart disease, cancer, and diabetes—are the leading causes of death and disability in the United States. Chronic diseases account for 70% of all deaths in the U.S., which is 1.7 million each year. These diseases also cause major limitations in daily living for almost 1 out of 10 Americans or about 25 million people. Although chronic diseases are among the most common and costly health problems, they are also among the most preventable. Adopting healthy behaviors such as eating nutritious foods, being physically active, and avoiding tobacco use can prevent or control the devastating effects of these diseases. Infectious diseases (also called communicable diseases) are diseases caused by germs. Germs are microbes (microscopic organisms) that are found everywhere - in air, soil and water. You can get infected by touching, eating, drinking or breathing something that contains a germ. Germs can also spread through animal and insect bites, kissing, sexual contact, blood transfusions, or by entering wounds. Vaccines, proper hand washing and medicines can help prevent infections. ↑ Checchi, Francesco. (2009). "Principles of infectious disease transmission: Short course on Infectious Diseases in Humanitarian Emergencies". WHO Unit on Disease Control in Humanitarian Emergencies. Accessed 29 July 2017. ↑ Influenza Symptoms by the U.S. Center for Disease Control, Accessed January 2, 2011. This page was last modified on 29 July 2017, at 21:34.